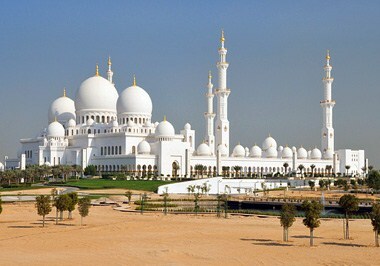 On the Arabian Peninsula, adjacent to the Arabian Gulf, Abu Dhabi is the largest of the seven emirates forming the United Arab Emirates (UAE). It comprises an archipelago of more than 200 islands, including Al Ain (an oasis city and UNESCO World Heritage Site). The dramatic shift, from a desert roamed by Bedouin tribes to a thriving metropolis fueled by oil revenue, continues to influence today's emirate, where traditional Arabian hospitality blends with ultra-modern amenities and technology. The city has UAE's second largest airport - Abu Dhabi International Airport (AUH), which currently has more than 30 airlines, flying to over 120 destinations in all six inhabited continents. The airport is located 32 km away from the city center and is well-connected with public transport. 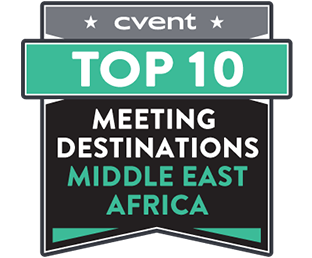 Of the conference venues in Abu Dhabi, the largest include Abu Dhabi National Exhibitions Centre (ADNEC), with 12 dedicated exhibition halls and two conference halls benefit from world-class facilities, is the largest in the Middle East. There is a wide assortment of hotel venues in Abu Dhabi, including city hotels, desert resorts, luxury Bedouin camps, beach resorts, and more. 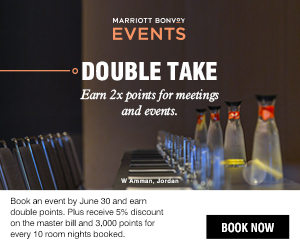 The largest hotel is the 844-room Grand Millennium Al Wahda, with 9,000 square feet of meeting space. The 302-room Kempinski Emirates Palace pampers guests with decor and comforts enjoyed by Arabian royal families; it has more than 24,000 square feet of meeting space in its auditoriums. 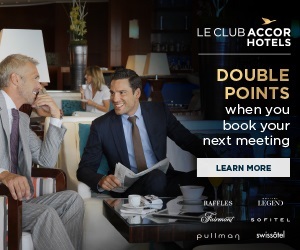 New hotels include the 382-room Jumeirah at Etihad Towers, with 30,000 square feet of meeting space; and the 283-room St. Regis Abu Dhabi, with nearly 17,000 square feet of meeting space. Special event venues in Abu Dhabi are special, indeed; these include Yas Marina Circuit, Zayed Sports City Stadium, Abu Dhabi Country Club, and Abu Dhabi Golf Club. Nearby Al Ain attractions include Al Ain Palace Museum, the original residence of the late ruler Sheikh Zayed bin Sultan Al Nahyan; and Hili Archaeological Gardens, with remnants of 4,000-year-old settlement. Of the conference venues in Abu Dhabi, the largest is Abu Dhabi National Exhibitions Centre (ADNEC), which, at 73,000 square meters of event space in 12 halls, is also the largest in the Middle East. It features 2 large conference rooms, 19 smaller breakout rooms and exhibition space of 65,080 square meters and catering facilities. In 2012, ADNEC relaunched the Abu Dhabi Hall as the ICC (International Convention Centre) Abu Dhabi. ICC Abu Dhabi has fully flexible, tiered seating for up to 6,000 people with 7,920 square meters of space. There is also the stand-alone, 1,500-square-meter Al Maa'red Hall, which specializes in weddings and social events. The second largest airport in UAE, the Abu Dhabi International Airport is spread over an area of 3,400 hectares. The airport is located 32 Km away from the city center and has three operational passenger terminals. Served by more than 30 airlines, flying to over 120 destinations, the airport handles flights from all over the world, including major destinations in Europe, Africa, North America, and Asia. The airport also provides non-stop services to all six inhabited continents. 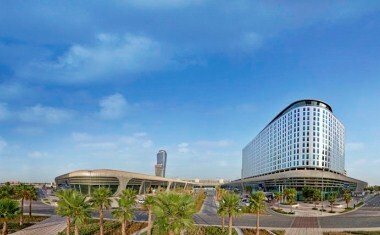 Public transportation well connects Abu Dhabi International Airport to the city center. The green and white A1 bus goes to the city and stops outside Arrivals at Terminals 1 and 2. It departs every 40 minutes, 24 hours a day. Travel time to the city is approximately 40 minutes according to traffic. Department of Transport in Abu Dhabi operates around 650 busses on over 95 service routes catering to more than 50 million passengers within the different regions of the Emirate of Abu Dhabi. The extensive network of buses connects all the major areas of the city with each other. The green and white A1 bus connects the city with Abu Dhabi International Airport and stops outside Arrivals at Terminals 1 and 2. This bus departs every 40 minutes, 24-hours a day. The Abu Dhabi Metro rail system is supported by tram and bus feeder services on a route of approximately 131 km. The Metro system came into existence with the motive of serving a large proportion of passenger trips and relieve traffic congestions on the highway network. 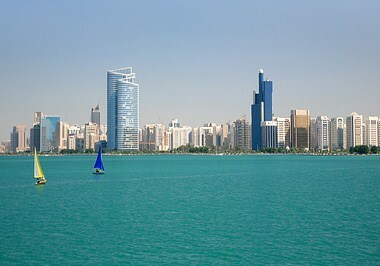 This network provides optimal connectivity between Abu Dhabi Island and its suburbs and upcoming communities such as Saadiyat, Yas Islands, and Al Raha Beach. The Department of Transport in Abu Dhabi operates two passenger and vehicle ferries to and from Delma Island through Mugharaq Port (Jabal Al Dhanna) and Delma Island Port. Both ferries have daily trips departing from each port, thus making it possible to visit Delma Island and return to the mainland in one day. All car rental services are available at the airport 24 hours a day, found in Skypark Plaza, opposite Terminal 3. Car rental companies represented at the airport include Thrifty, Avis, Budget, and Europcar. Metered airport taxis are readily available outside the arrivals hall and trips to the city center. The journey to Abu Dhabi takes approximately 30-35 minutes. Luxury airport taxi services are also available for passengers arriving at Abu Dhabi International Airport around-the-clock. There are no current promotions in Abu Dhabi, UAE.